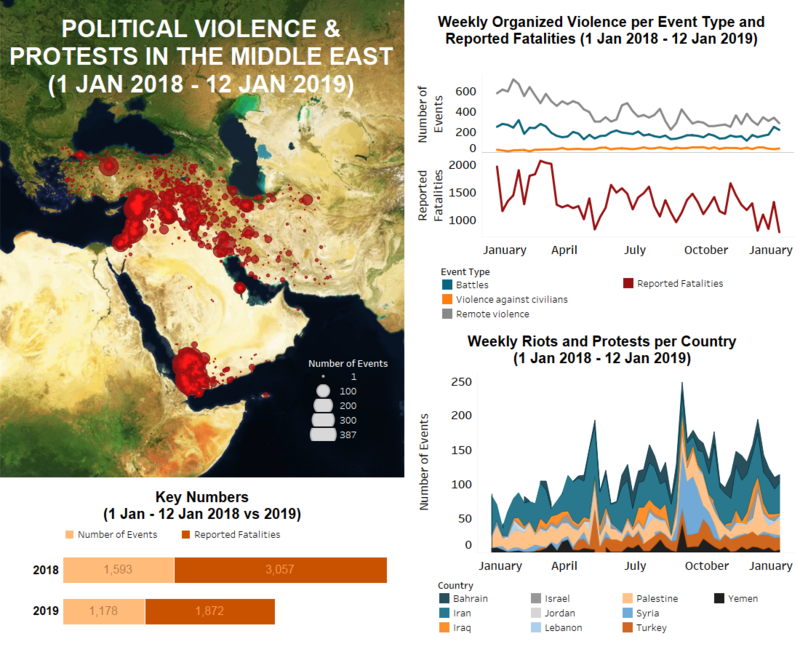 Throughout the Middle East region last week, political violence and reported fatalities decreased since the week prior, the latter significantly. This decline can be attributed for the most part to Syria, where, among other things, Islamic State (IS) activity has dropped due to recent successes against the group in Hajin. Meanwhile, riots and protests have generally remained consistent with previous weeks. In Israel, incendiary devices and rockets were once again launched from Gaza into HaDarom province following a period of relative calm, although they reportedly did not cause any damage and there were only a few reported cases. The rockets, most likely fired by Hamas and/or Palestinian Islamic Jihad (PIJ) given their recent history and access to rockets (Haaretz, 13 November 2018), prompted shelling and airstrikes in retaliation from Israeli military forces. At least one rocket reported to be launched by PIJ militants was intercepted by the Iron Dome near Ashqelon. Elsewhere in the country, protest demonstrations occurred in both Jerusalem and Haifa last week. In Jerusalem, demonstrators gather and blocked roads against the arrest and treatment of five young Israeli settlers who are currently being held for the alleged murder of a Palestinian woman. In Haifa, clashes occurred between Christian demonstrators and police over a controversial art exhibit at Haifa Museum depicting a crucified Ronald McDonald. In Palestine, Israeli forces responded to rocket fire and incendiary devices launched from Gaza with multiple airstrikes against alleged Hamas sites. There were no casualties reported in these airstrikes. Meanwhile, during the Friday Great March of Return demonstrations along the Gaza border, a woman was reportedly killed, and at least 25 others were injured, during clashes with Israeli forces. In the West Bank, sectarian violence continued with six reported settler attacks: four occurring in the Hebron area, and two near Nablus. Additionally, a Palestinian was reportedly killed by Israeli forces while allegedly attempting to carry out a stabbing in Kiryat Arba settlement, near Hebron city. Another Palestinian was shot and injured after ignoring Israeli orders to stop at Zatara checkpoint. There were a high number of clashes between Palestinian youth and Israeli forces, particularly in the area around Ramallah. This is due in part to almost daily Israeli military raids in al Bireh and Ramallah. In Jordan, Syrian refugees continue to return to Syria through the Naseeb border crossing. On 7 January, it was reported that around 400 Syrian refugees returned to Syria. On the same day, employees of Aqaba Railways protested in Aqaba, calling for salaries, promotions, and better living conditions. In Lebanon, public drivers held demonstrations in at least Beirut, Baalbek, and Al Hadath on 10 January against the privatization of the auto inspection sector. Meanwhile, similar to weeks prior, there was a protest march on 12 January against corruption, unemployment, and the delayed formation of a new government. However, this particular protest movement seems to have lost some of its momentum since its height in late December 2018. In Iran, demonstrations by workers, teachers, students, and farmers continued over the past week. Several demonstrations were held by car buyers, who in anticipation of recent price hikes have registered and partially paid for their vehicles, but have not yet received them. Amid recent inflation in Iran due to the devaluation of the national currency – partly caused by the re-imposition of US sanctions – vehicle prices have risen at an unprecedented rate. Car buyers indicate that further delays in handing over their vehicles means that they will have to pay even higher prices. In Bahrain, riots and protests were aimed at commemorating the third anniversary of the execution of Shiite cleric Sheikh Nimr Baqir al-Nimr in Saudi Arabia, and the second anniversary of the execution of three Shiite men who were convicted of killing three police officers. Furthermore, demonstrators also condemned the Saudi regime for reportedly killing six Shiite men in a recent security raid in the predominantly Shiite region of Al Qatif on 6 January. In Turkey, labourers working for the Izmir municipality in the transport, energy, and urban structure areas demonstrated after the local government blocked a union from joining collective bargaining meetings. Several demonstrators were reportedly injured when police intervened. In the southeast, Kurdistan Workers’ Party (PKK) militants continued to battle with Turkish security forces, with clashes reported in the provinces of Igdir, Hakkari, Diyarbakir, and Siirt. In the latter, PKK militants were reportedly cornered in a cave in Eruh district, similar to an event from the previous week where a siege was laid on a cave in Ovacik district of Tunceli. PKK militants often use the mountainous terrain of the region to their advantage as bases of operation. Meanwhile, Turkish air excursions continued into the Dahuk and Erbil governorates of Iraq, reportedly leading to seven PKK fatalities. Also in Iraqi Kurdistan, a number of Kurdistan Society Freedom Movement (Tavgeri Azadi) senior officials and 50 other people were arrested by security forces in Sulaymaniyah city for condemning the assassination of three female Paris-based PKK activists on the third-year anniversary of the event. Meanwhile, supporters of the Patriotic Union of Kurdistan (PUK) gathered in front of the presidents’ headquarters in Kirkuk city to protest against the government’s decision to take down the flag of Kurdistan from the top of the party’s headquarters. In the south, only one demonstration was reported in Basrah, signalling at least a momentary decline in regional unrest. Elsewhere in Iraq, there was a rise in IS attacks, with at least two major car bombings occurring in Tikrit and al Qaim, which reportedly led to high civilian and police casualties. In Yemen, a number of impactful events occurred last week, with the most noteworthy being a Houthi drone attack that struck the Anad military base in Lahij governorate, reportedly killing six anti-Houthi elements, including high ranking military personnel. Similar drone attacks were also reported by Houthi sources on Saudi military targets in the Jizan and Asir border regions of Saudi Arabia. Meanwhile, Houthi forces clashed with anti-Houthi forces across generally static battle lines throughout the week, with some small territorial gains being reported by anti-Houthi forces around Damt city in Ad Dali and in the northern governorate of Al Jawf. In Al-Baydha, Al-Qaeda in the Arabian Peninsula (AQAP) and IS fighters continued to clash in low-fatality incidents. IS militants reportedly executed four civilians accused of blasphemy in the Yakla area of Wald Rabi district, Al-Baydha governorate. Finally, incidents of short clashes and shelling continued in Hodeidah port city throughout the week despite efforts to completely stop all military activity in the city under a ceasefire agreement signed in Sweden. Local incidents appear to be decreasing in number, although they continue to occur every day. In Syria last week, violence was geographically scattered except for a hotspot in the northwest of the country due to Hayyat Tahrir Al Sham (HTS) activity. In line with events in previous weeks, HTS continues to fight and take over territory from the National Liberation Front – this time in northern Hama governorate. The group now controls vast swaths of territory to the southwest of Idleb. At the same time, regime forces continued to shell northern Hama and southern Idleb governorates. Along the Menbij frontline, little preparatory activity was reported for Turkish soldiers and Turkish-backed rebels, who had earlier massed there in anticipation of an assault on Syrian Democratic Forces (QSD). It appears that the recent Turkish row with the American Trump administration has cast doubt over the offensive – at least temporarily (BBC, 14 January 2019). Lastly, IS activity continues to be reported in the Hajin pocket, though the group has been on the retreat over the past few weeks. Additional IS activity – ambushes and suicide attacks – were also reported elsewhere, such as in al-Hasakeh city and Raqqa.